Summer is not the time to visit Furnace Creek (they boast a recorded air temperature of 134 degrees on a July day, a world record.) Winter, however, offers stunningly clear days of 70+ degrees. 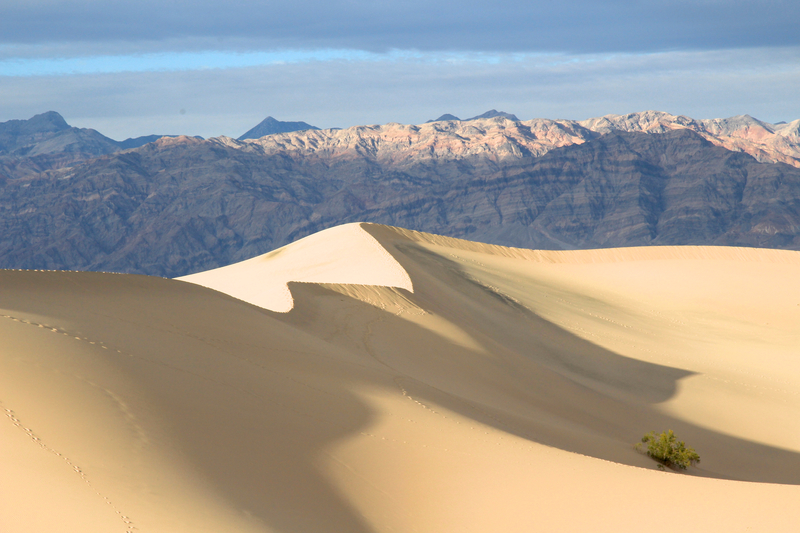 Take a ramble around the three million acres of Death Valley National Park. Plant yourself at the pool of the historic Furnace Creek Inn and watch the sun set over the mountains. And after a good meal there, sit by the oasis and stargaze at one of the darkest skies in the U.S.
We are dodging heavy clouds and being buffeted by winds along the Central Valley until we pop over the Panamint Range, dropping down to the Furnace Creek Ranch Airport. Here in the center of Death Valley, a land known for extremes, all is calm and mild. At this spot the valley floor sits several hundred feet below sea level and is one of the driest places in the country. And yet it has enough ground water for a cluster of ducks and herons to inhabit a small pond. The remnants of a date palm plantation, one of the hundreds of evaporated business ventures that haunt Death Valley, surrounds a small tourist village. In all directions there is the profound quietness of desert. The first European Americans to come here gave Death Valley its name in 1849 when they got lost looking for a short cut to the gold fields of California. Several short-lived boomtowns sprang up during the late 19th and early 20th centuries to mine gold and silver. The only long-term profitable business was mining borax, which was transported out of the valley using twenty-mule teams. In the late1920’s the desert air and curative spring waters drew tourists to the newly built Furnace Creek Inn and Scotty’s Castle to the north. On previous stays in Death Valley, we drove scenic State Route 190 visiting salt-flats and sand dunes, badlands and craters on way to Scotty’s Castle, now a monument run by the U.S. National Park Service. This time we stop by Farabee’s Jeep Rentals just across from the Furnace Creek Inn. We drive out with waters, GPS and an emergency locator beacon (in case we do something stupid, I guess) to explore some of the 350 miles of unpaved four-wheel drive roads that go deeper into wilderness. 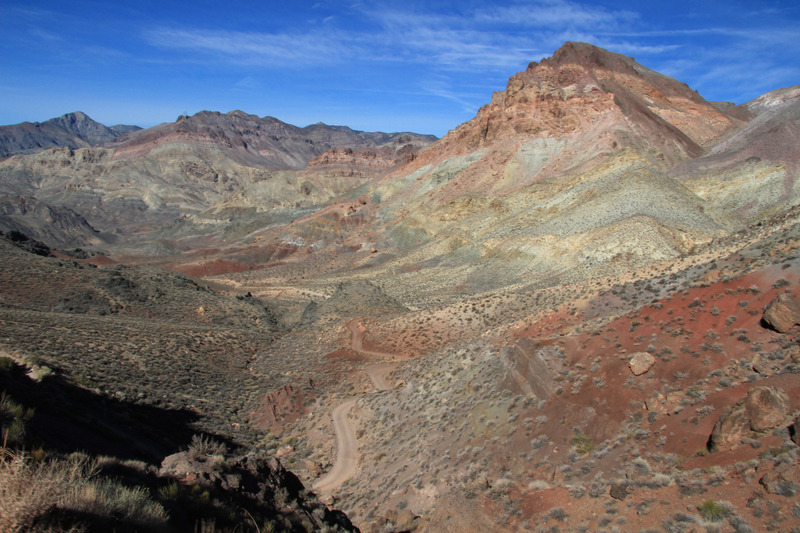 Heading northeast on Hwy 374 we enter Nevada for 3 miles then turn a sharp left heading back into California on a track marked “Titus Canyon.” The jeep bumps down a wash-board dirt road and enters chromatic mountains streaked with yellow, violet and burnt orange. Climbing over Red Pass (5,250 ft.) we descend an ever-narrowing one-way road through hillsides speckled with mining ghost towns, petroglyphs and fossil beds. 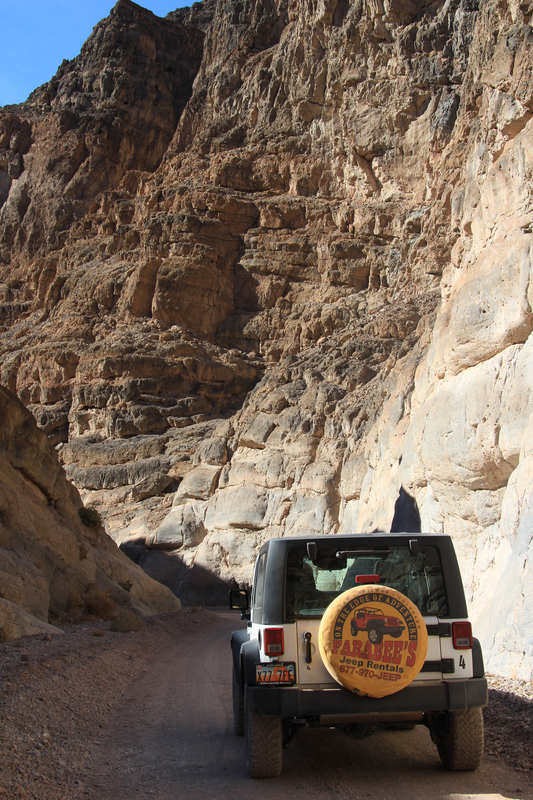 The road snakes through Titus Canyon to the Narrows, the final 1½ miles, where a jeep just fits between walls that squeeze in on either side. It is here that visitors sometimes get caught in a flash flood that sweeps them away, jeep and all. But not today. We emerge from the confinement of the Narrows and head for an entirely different environment…the smooth expanse of Mesquite Flat Sand Dunes. They are just one more of the many unique environments so enjoyable during winter in Death Valley. Just rereading, now that I have more time. Another evocative travelogue, very interesting and reminded us of our Furnace Creek visit a couple years ago. Thanks, Karen!